If you are in need of specialized medical bed accessories, you will find a wide range of products from Allegro Medical that can help. 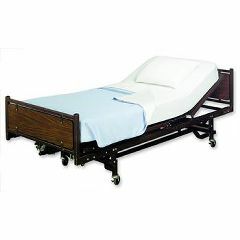 You will find adjustable safety bed rails of different styles and sizes, bed sheets, bells, mattress covers, disposable basins, sensor alarms, bed canes, hospital bed tables, and similar items. We offer brands including Val Med, AliMed, Stander, Inc., and Rehab World. Check out AllegroMedical.com to see all of the products we offer. Our Best Price Guarantee makes sure that you get the lowest prices possible. Reliamed Fitted Hospital Bottom Sheet - 36" x 80 x 8"
White Bed Sheet - 54" x 81"
Thank you ! You guys are GREAT. My order was submitted, processed, shipped out and received....all in the flash of an eye. I also appreciate your e-mail welcome and and shipping update. You are THE BEST!